The Ranger’s Apprentice meets The Prince and the Pauper in this exciting story. Sage, a young orphan boy, has plenty of wit and daring. When Connor, a nobleman with questionable intentions, selects Sage and four other orphans for something special, it doesn’t take Sage long to determine the man’s intentions. The country is on the brink of civil war, enemy nations are poised to attack, and the royal family is dead. Connor needs someone to fill the throne. At the end of their training, one boy will be selected as the false prince. The other boys will be disposed of. It’s not often I read, much less enjoy, a recently published, secular book. The False Prince was an enjoyable exception. After reading a couple positive reviews from friends, I reserved this book at the library. Once I got into it, I couldn’t put it down. While Sage does possess some undesirable traits (i.e. a penchant for theft), he generally exhibits good character qualities. The book as a whole contains no inappropriate content that would make me hesitant to recommend it (refreshing!). I couldn’t wait to get my brother to read it. 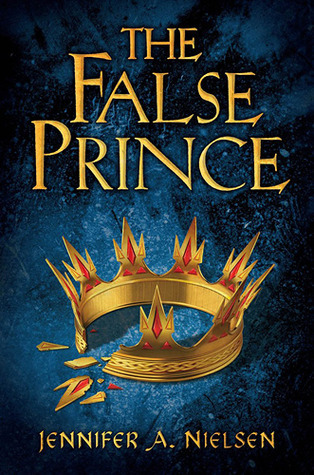 Have any of you read The False Prince yet? Does it sound like something you would like? That is so funny, Leah. My sister and I were just talking about Sage this morning. This was one of my favorite books I read in 2013. I tend to shy away from magical fantasy unless it’s something like Narnia, though. Love this book! I actually needed someone to tell about the big surprise near the end. My brother doesn’t like to read and said I could tell him. I told him the whole plot and then he decided to read it… already knowing everything that would happen… and still loved it! We both read through the whole series in about a week.